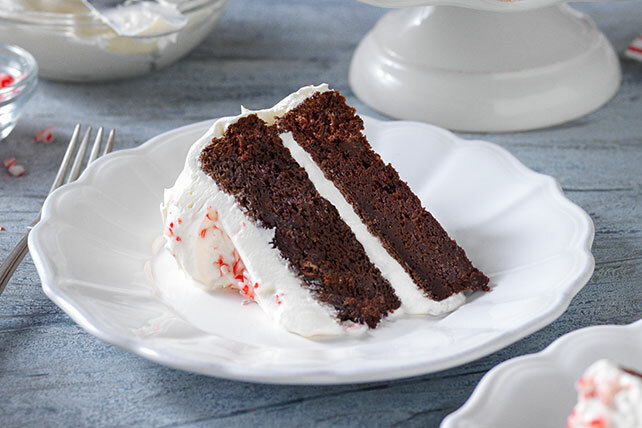 Frosted with fluffy whipped topping, this chocolate cake is moist with chocolate pudding and pepperminty with crushed candy canes. Beat first 7 ingredients in large bowl with mixer until blended. Stir in chopped chocolate and 2 Tbsp. crushed candy. Pour into 2 (9-inch) round pans sprayed with cooking spray. Savor a serving of this special-occasion dessert. At 18 servings, it's perfect to serve at your next holiday party. Melt additional 1 oz. BAKER'S Semi-Sweet Chocolate; cool. Drizzle over cake just before serving. Garnish with fresh raspberries.